This will be D.C.’s second Canopy by Hilton hotel. The Courtyard by Marriott hotel at 1600 Rhode Island Ave. NW is about to get a facelift. After 20 years flying the Courtyard flag on Scott Circle, owner The Bernstein Co. will revamp the hotel during the next few months an turn it into a Canopy hotel from Hilton Worldwide Holdings Inc. (NYSE: HLT). 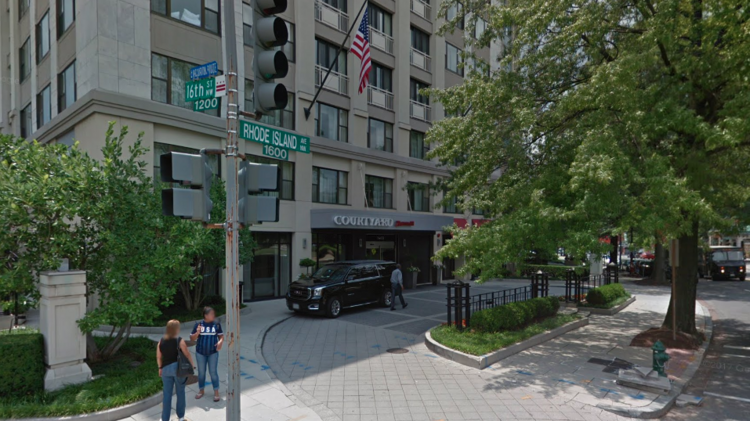 The Canopy D.C. Embassy Row aims to open in late spring, according to the company’s website. Bernstein is working with Edge of Architecture and Alliance Architecture on the redesign, which will “embrace the classic architecture of the neighborhood while juxtaposing funky artisan touches showing the cultural diversity that surrounds our address,” according to the site. The property’s 154 rooms will get new finishes, updated bathrooms that replace the tubs with showers, and the new no-closet model standard in Canopy hotels, according to a D.C. building permit issued for the project. The renovated hotel will also feature Canopy Central, the main-level restaurant and lobby that combines a cafe, breakfast spot and cocktail bar. It wasn’t immediately clear whether that will move into the space that formerly housed Nage Bistro, which closed in September, or whether a separate restaurant would move into that space. We’ve reached out to Bernstein Cos. for more information and will update this post when we hear back. Canopy, which Hilton launched in 2015 as a lifestyle-oriented full-service brand, opened its first local hotel at The Wharf in 2017. Another Canopy at Pike & Rose in North Bethesda followed soon after. At The Wharf, Canopy has made a name for itself with one of the city’s best rooftop bars, Whiskey Charlie. The hotel at 16th Street and Rhode Island Avenue NW has been a Courtyard since Bernstein Cos. decided to convert it from an office building in 1997. Fun fact: Before the conversion, the building housed the National Rifle Association’s headquarters. It’s the second longtime Courtyard to change flags in the District in the past few months. The owner of the Courtyard by Marriott at 900 F St. NW, which also opened in 1998, recently dropped the flag to turn it into an independent hotel run by the Lore Group.